Who would think that taking second-year French tests could be so much fun! The imaginative exercises will have your teen identifying the product that fits the description, matching opposites, giving directions, and labeling sentences as logical or illogical. Various sections give comprehensive coverage of the grammar, vocabulary, and sentence construction skills needed for a thorough foundation for beginning French. 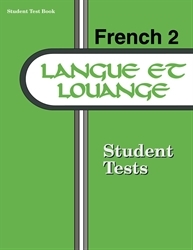 The tests covering one year of French are correlated with the texts Langue et louange for French 2A (1991), Langue et louange for French 2B (1991), Vocabulary Manual for Langue et louange (1991), and Langue et louange Teacher Guide, which includes weekly plans. Answers and point values are sold separately in Langue et louange Teacher Test Key. Grades 9–12. Objective-testing formats include multiple choice, modified true/false, matching, and short answer. You will appreciate sections that evaluate even content such as word placement, translation, and Bible memory verses in an easy-to-grade format. Brief test sections that call for the students to modify, translate, or compose complete sentences evaluate your teen’s understanding on a higher level. Included in this year’s tests are a few reading comprehension questions over French history from the cultural readings in the texts, building your teen’s cultural context. Other test content includes gender; vocabulary; verb, adjective, pronoun, and adverb forms; formation of negatives, questions, and plurals; and sentence construction—essential tools for a beginner’s growing communication skills in French. English instructions for each section help both the parent and new language learner know precisely what is expected. The 12 tests provide vital reinforcement of learning and an opportunity for your evaluation of your teen’s understanding. You can know when additional explanation or practice is needed with one concept before progressing to the next one. Since each student test clearly specifies the sections covered, adjusting tests to your schedule is easy. Two comprehensive nine-week exams and semester and final exams further reinforce the concepts learned throughout the year.